Whoa. SEBI Says Indians Are Not Allowed To Manage Foreign Funds into our Market. SEBI has something up it’s sleeve, always. The market regulator has spooked a few people, in a sweeping regulatory move that seems to say that if you’re an NRI fund manager, you’re just a money laundering scumbag. If you were, perhaps, not Indian, we would be fine, even if you were a money laundering scumbag. There has been a suspicion, in India for decades, that the money coming in from abroad is mostly Indian money that’s gone out and returned through the FPI route. Even if we got documented evidence of every dollar that has been invested, including how that dollars was earned, the bank accounts of the parents and children of the owner of every single foreign invested dollar, there will still be people saying, Abeyaar, this is just Indian money they know how to cook the books. You can’t win because we are a nation of conspiracy theories. If people give to a flood ravaged state, the suspicion is the state will siphon it off for to line some pockets. If you give a beggar a little more money, some well-meaning soul will tell you how people like “them” are just going to use it for alcohol. If you do something good, it’s horrible because why did you not do something even better, and how dare you until you solved world hunger. We pass our little judgements, we love our vivid imaginations, and we hate it when someone proves, with data, that the theory is plain wrong. Why let facts get in the way of a good story? So let’s tell it like it is believed to be, rather than what it is. Every person outside India who wants to invest in India in just bringing in black money. It’s horrible, these people have no morals. Mostly they are NRIs. They left the country and now they want to throw crumbs at it? They want to manage foreigners’ money and bring it to India. They want to invest in our country so much, that they own half of the non-promoter shares in the country. As if they are doing us some charity by leaving us with so little shares for ourselves. They are scoundrels, and will run off a the first opportunity. They will take money through hawala and bring it back. So punish all of them. Make sure they can’t invest like this anymore. We won’t stand for it. Now that you have got the sentiment, you might understand what has been done. SEBI on April 10: You FPI people. Don’t Be Indian. The BO is anyone who owns a 25% or more stake if the FPI is a company. Or 15% if a partnership. Or 10% if shady country based FPI. And such. In that case the fund manager (or the “senior managing official”) is the BO. No Indian (resident, or NRI or OCI) can be a Benecial Owner. The Concept was: If you are an NRI don’t do things through the FPI route which masks you behind some company or such. Come straight to India, register as an NRI and invest. India has some extreme rules for NRIs to invest in India. (Apart from maybe bank FDs where they don’t even pay tax) This is their home country, remember. They have to have a PIS account, pay much much higher brokerage fees, pay capital gains taxes on every transaction (if you have an offsetting loss, too bad – that’s a tax collection nightmare) and so on. But that’s still okay. Anyone who’s an FPI investor with 25% in a fund can just bring his or her investment down to below 25% or come in direct. Being 25% of an FPI means you’re loaded. So you can spend a bit of money getting some of the formalities done. Or choose to exit India. It’s a little crazy to ask, but this ask can be fulfilled. But what’s crazy is: consider a fund manager who’s raised money from lots of people – entirely foreigners. No one owns 10% in his fund. He’s Indian, but is resident in say Singapore or such. He has raised funds because he knows India. It’s tough to invest in Vietnam without having some knowledge of Vietnam. Either you go there, or you find a guy who knows about investing in that country. Chances are that person is Vietnamese, which gives you confidence because hey, he should know about Vietnam if he’s Vietnamese. And then if he’s got a fund that invests in Vietnam, you invest in that fund, for his knowledge. ​​​​​​​Replace Vietnam with India in the paragraph above. Still makes sense. The rule is that if you’re a diversified fund, (no single person owns more than 25%) then your fund manager is considered the beneficial owner. And the beneficial owner cannot be Indian. If the fund manager is Indian, the fund is toast. Finito. Can’t invest. Essentially, foreigners can’t invest in India through a fund managed by an Indian person. If a fund manager isn’t Indian – say he’s Vietnamese – then that fund can invest in India. This is true because in our conspiracy theory world, Indians especially non resident Indians are pond scum and therefore cannot be trusted to bring money into the country. Vietnamese or any other nationality are fine. In fact, here’s the deal. There’s an ETF by iShares, which invests in Indian stocks. If the fund gets a manager who is an NRI in the US, that fund can’t invest in India. Some poor bloke can’t even apply for such a fund because oh goodness, Indian passport. I fervently hope SEBI didn’t actually mean this. They might have wanted to plug a loophole but ended up creating a situation where lots of legal, legit funds will be denied access. But if they don’t, then here’s the thing: These funds have to wind up or change their structure by December 31, 2018. Winding up is possibly a last alternative. These funds might simply choose to have a different fund manager, and use the Indian origin manager as a “consultant” instead. But now they have to tell all the investors they’re doing this, and some institutions (like pension funds) may decide to not allow such a change even if it’s only for regulatory needs, and that creates a lot of uncertaintly. Still, if such a restructuring can’t be done, they’ll have to shut their investments and go back home. No one will want to destroy the market unless they absolutely have to. 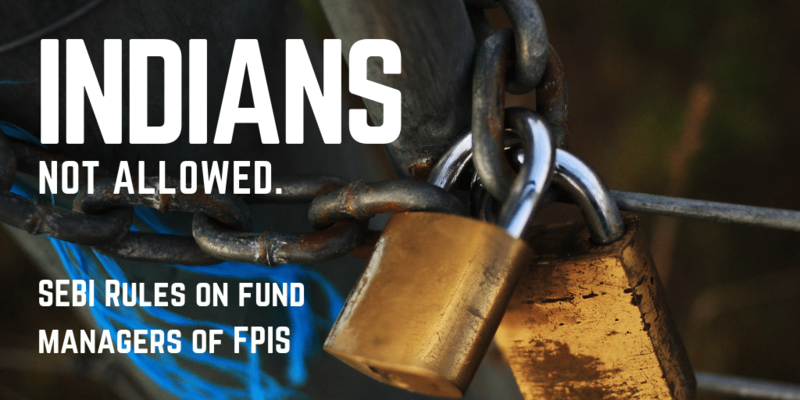 A lot of money comes through FPIs managed by Indians – some say $75 billion. (That’s only about 5 lakh crores, which is probably 20% of all FII investment in India). If they have to leave, it will be disruptive. So I think it would be imperative that SEBI come to some kind of agreement, if they really believes one things: Indian Fund Managers Are Not Money Launderers. By December 31, the rules of the game, need to change. Let’s just hope it will. Because otherwise the conspiracy will be that these NRI fund managers left because they were handling black money – not the truth, which is that the SEBI regulation made it impossible for them to exist.